Hi, my name is Marc and I'm from Holland. I don't own a XR4Ti myself. They were never sold in Europe, so I've only seen a few ever. But I'm a massive fan of the Sierra and it's US cousin the XR4Ti. I was googling some stuff about the Sierra and came across this forum and figured it would be nice to see what's happening with these cars at the other side of the ocean. I do own 2 Sierra's though. One is a 2wd 4 door sedan that came from the factory as a basic 2.0. I've upgraded the suspension and brakes to Cosworth items and the engine has been changed to a Scorpio Cosworth 2.9 24v BOA engine using a manual gearbox. Unfortunately the car hasn't run for 3 years as it didn't pass its yearly check due to rust issues. I have another shell that is completely rust free waiting to re-shell the car. A picture of the car in it's better day. The other Sierra I have is a Cosworth 4x4. The engine is slightly tuned and I've upgraded the brakes and suspension. 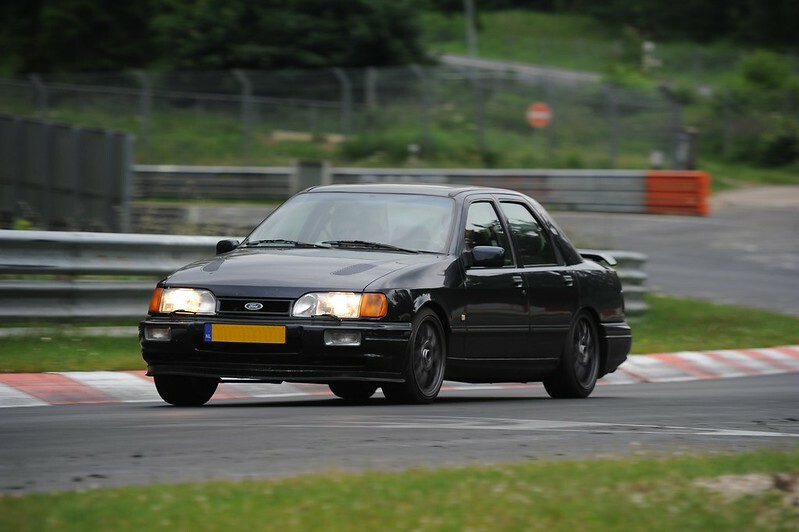 I like to take it to the track, which I actually should do a bit more often. Hello Marc, we are delighted to hear from you! You have some nice cars-- I don't know if it's possible to reasonably repair the 2WD, or perhaps you might find a better body shell. We look forward to more photos and posts from you. The body shell of the 2wd had already been repaired more than once. It was not really a surprise the car was getting worse, as the car, or at least the shell, had done about 410.000 km through all weather, so also quite some snow and salt. Knowing I would never get it fully restored I decided a few years ago that it was time to re-shell it as the rust issues kept getting bigger and bigger. At that time I found an almost rust free, completely standard Sierra in exactly the same colour. By now this car is completely stripped but I haven't started the re-shell because I'm first extending the garage. That way I can do the re-shell in the garage at home and when the car is finished it can also stay inside. Would have loved to see the 4WD Sierra make it over here. I recall seeing how Ford was planning on making it the third Merkur model, or at least exploring it. Unfortunately, sales did not warrant the cost. The Sierra 4x4 is indeed fun to drive. The amount of grip when accelerating out of corners is really amazing. But it does need to have enough power to fully take advantage of the 4x4. With up to 250 hp I think I would rather stick with 2wd. And it's a bit of a shame that the 4x4 gearbox is not really that strong. Anything over 350 hp is hoping that is stays in one piece. Welcome to the Merkur Club of America aka "MCA". The MCA is open to everyone wherever they live. We have members in Africa, Australia, Canada, England, Germany & Poland and now Holland! Email me your postal address and phone number and I'll send you more information and links to other helpful resources. Thanks for the offer, but I'm not looking to actually become a member since I don't own a real Merkur. 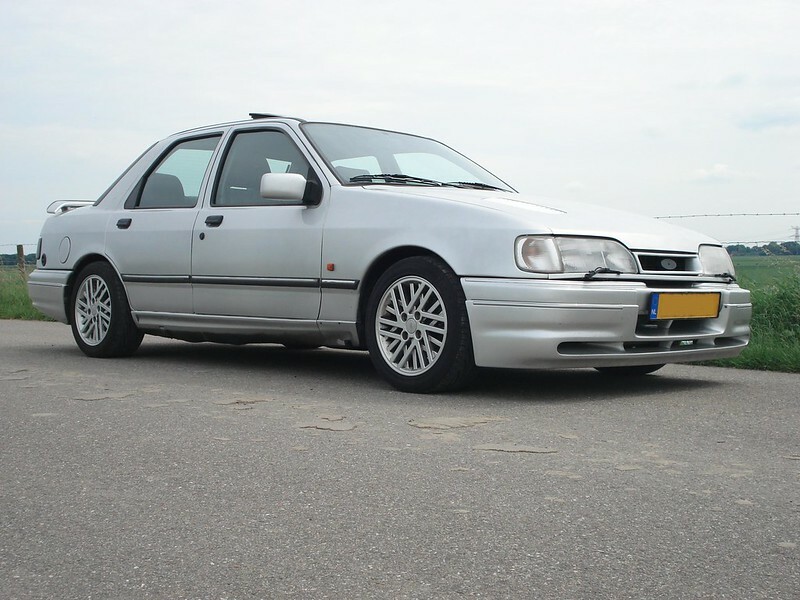 Sierra, Cosworth, Granada - whatever their formal Ford name - they're cut from the same mold and their owners are always welcome. Many MCA members are very curious and few looking for pars from non-US spec Fords as well as for the few non-US spec ones that have been imported. Yep. The dash from 92-93 comes to mind.